Once upon a time there was a little girl who had MS. She lived in Indiana with her Auntie Vi, Uncle Arthur, and Mother Rosie. She loved her life with her family, but dreamed of a place faraway, a place full of adventure and a cure for MS…some place over the rainbow. One especially dark night, there was a tornado that blew the little girl up, up, and away. When she awoke, she was in a very strange land and she was afraid. She saw a sign: “Welcome to the Emerald City, Seattle!” Before she could think about that, a blue seagull flew over her and sat down in front of her. Diane saw before her a path of yellow. With each step she encountered an odd sensation: vertigo, stars in her eyes, numb feet, weak hands, piercing migraines, depression, and a heaviness in her legs. As she walked further, she saw a corn field ahead and hoped there might be a cob to snack on. If only she could make it one…more…step… suddenly Diane felt a soft tap on her shoulder. Standing behind Diane was a beautiful woman in a billowing dress holding a wand with a bright white star on the tip. “Dear, where are you headed?” spoke the gentle lady. “You must stay on the yellow sick road. But be very careful along the way,” said the good witch as she started to be blown upward, “the wicked witch of the west coast is never far away. Stay on course, my precious child. And good fortune to yooooooou,” her dress blew up like a sail and she floated into the clouds as silently as she had appeared. “No! Don’t leave me all alone with MS!” cried Diane. “BREAK THE BLOOD BRAIN BARRIER!” they screeched as they flew. Off the two went, both falling and getting back up as they moved, neither expecting what jumped out in front of them---a lion! He roared so loudly that the straw blew out of the scarecrow and all that remained was his hat and two button-eyeballs. “Look what you did!” shouted Diane. What was that, they wondered. KEEERRR-PLUNK. In their path a tin can fell. “Help me. Please help me.” Diane thought--- what next? A talking scarecrow, a cowardly lion, and now a talking tin can? A glance to the right showed that in fact this was the head of a tin MAN! The scarecrow took off running, returned with an oil can and began to oil and reconnect the tin man’s head. “Oh, that feels chicken-biskets good! Thank you. Who are you wonderful creatures?” asked the well-oiled tin man. After introductions were made the troop became four. The tin man wanted a heart. But before they began to skip, the flying T-Cells and viruses had arrived. They swarmed Diane, causing her body to stiffen like iron. “Lion, swat them!” commanded the scarecrow, “Tin man, put your cool metal on her. I’ll give her my stick arm to walk with.” The tin man wrapped his cool arms around Diane and the lion bit and swatted the T-Cells until they gave up and flew away. 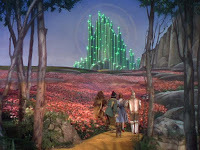 The wicked witch of the west coast was furious at her immune system “mission unaccomplished” and she took a step outside to shoot her returning warriors with Solu-medrol; but the Emerald city rain dealt her a deadly blow. “I’m melting.” The Seattle rain melted her away forever. Her anger blinded her to the effect fresh rain had on her. “WHO GOES THERE?” bellowed a booming voice from the top of the space jousting needle. The lion began to shiver and the scarecrow turned to leave, stopped only by the tin man. Diane spoke, “I want a cure for MS. Scarecrow wants a brain, Lion wants courage and Tin Man wants a heart.” “GO AWAY” Go away? That’s it? “Look, an elevator, let’s go to the top,” said the scarecrow. Up they went until the doors opened and there, standing with a microphone was: Madonna. “Excuse me? JUST? I am a music legend, a cultural icon. Yeah, I’m a frigging wizard too AND I write children’s books. I’ve been watching you. You are all jerks. Lion. You want courage? YOU’RE A FRIGGIN’ LION, King of the Jungle. You gave an arse whuppin’ to those T-Cells. Tin man, woe is me; you want a heart, WHAT ARE YOU A VIRGIN? You hugged Diane when she was down. You cared about her. That takes heart, you dope. And YOU, scarecrow, you want a brain? WELL JOIN THE CLUB! You figured out how to save Diane and fix tinny and put your own SELF back together WITHOUT YOGA OR BOTOX. You bowlbeepers already HAVE what you want. Madonna took off her cone bra and put her hands on her hips. 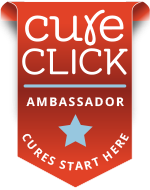 “Listen Kid, right now there is only one cure for MS that’s plausible, and the good witch gave it to you the moment you landed in Plaus; and that is hope, a belief that if you just follow your dream anything is plausible. Anything is possible." Lanette returns from her wedding in Jamaica. Yeah Mon, photos included. Shauna visited Jack's Lake and saw deer tracks and an old bridge. 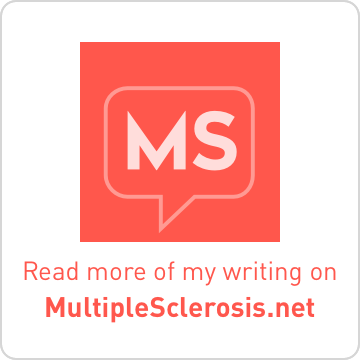 Lisa discussed Spasticity, Disabilty, and Solumedrol at Multiple Sclerosis Central. Barbara shares A BODILY SCREAM OF INNER LONELINESS. Nadja, the Denver Refashionista, is Cured!! No, not that kinda cured. Go read. Anne thanks everybody for More Success!! in raising funds for Herrad's cushion. I thank you too and Herrad received the funds yesterday. Whooohoooo!! 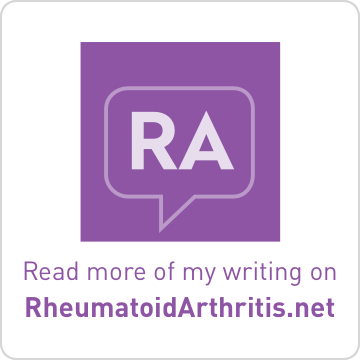 Richie, Herrad's Sweetie, shares what a typical day entails for a caregiver. Thank you Richie for all that you do. And Serina shares a favorite Christmas Story about Big Wheel in Indiana. This concludes the 24th edition of the Carnival. The next Carnival of MS Bloggers will be hosted here on December 11, 2008. Please remember to submit a post (via email) from your blog of which you are particularly proud, or which you simply want to share, by noon on Monday, December 8, 2008. Thanks for the shout out. Happy thanksgiving to you.